Drink 35 gallons of water a day. Have an acute sense of smell and can smell something up to 6 miles away. Almost all chew at least 50 times a minute. Are sociable and form large herds. Can climb up stairs but cannot get down them. Can run faster than horses in boggy, soggy, deep muddy places. Can live for 15 to 25 years. Moo in accents specific to their region. Have 'best friends' and can become very stressed when separated from them. Produce the most milk when listening to the song Everybody Hurts, by REM! Can moo in accents specific to their region. Don't have upper front teeth. More people are allergic to cow's milk than to any other food. A glass of cow's milk has twice as much solid content as a tomato. 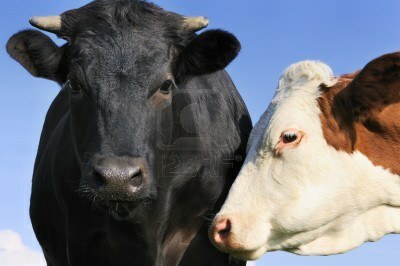 Cows make friends and are sad if they are separated from them. Cow bells make cows feel stressed. whether it be red or bright yellow! * Can run faster uphill than they can downhill. ​Cows are herd animals and stick together to reduce the threat from predators. It makes sense for them all to graze in the same direction, so the herd stays together as it drifts around the field or across the savannah. Facing the same way also cuts down on conflict in the herd because it avoids head-to-head confrontations. ​A herd of cattle and a flock of sheep grazing together in the same field is known as a 'flerd'.